Togo’s President and chair of the regional ECOWAS bloc, Faure Gnassingbe, and Niger’s President Mahamadou Issoufou on Monday vowed to help Burkina Faso fight and defeat militant groups. The presidents of neighboring Niger and Togo traveled to Burkina Faso on Tuesday (March 6) to assess the aftermath of the terror attacks, which killed 8 people last week. 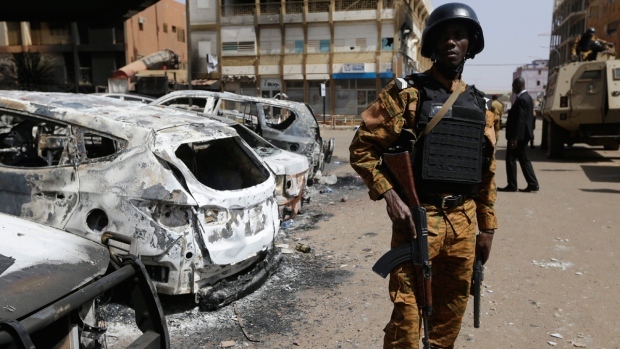 An Al Qaeda affiliate claimed responsibility on Saturday for the attacks on the army headquarters and French embassy in Ouagadougou. The G5-Sahel permanent council, chaired by Niger President Mahamadou Issoufou, also met in Ouagadougou. Although Togo is not member of the G5 Sahel group, Togolese President Faure Gnassingbe attended the meeting. The aim of the G5 Sahel, mustering Burkina Faso, Chad, Mali, Mauritania and Niger, is to drive out terrorist groups, smugglers and organized criminal gangs that are taking advantage of the weakness of the state in certain areas of the region. An international high-level conference on the Sahel held in Brussels recently raised €414 million to support the G5 Sahel Force. UN Secretary General Antonio Guterres has recently warned that the Sahel region was descending into all-out violence and called on the world body to help the region confront the threat from Islamist militants. Posted by Khalid Al Mouahidi on March 6, 2018. Filed under Zoom. You can follow any responses to this entry through the RSS 2.0. Both comments and pings are currently closed.